There was something very interesting I noticed during this past series against the Boston Red Sox. And it had absolutely nothing to do with with what happened on the field, it’s what happened in the stands. If you attended any of the three games this weekend I’m sure you noticed a heavier than normal crowd at the Rogers Centre as well. I say heavier than normal because these kinds of crowds are typical of marquee summer series, rather than a rain-filled weekend in early June. Over the weekend, the Globe and Mail had a feature on how the Blue Jays are facing an uphill battle trying to draw new fans to an old ballpark (featuring the wonderful Meredith Rogers). 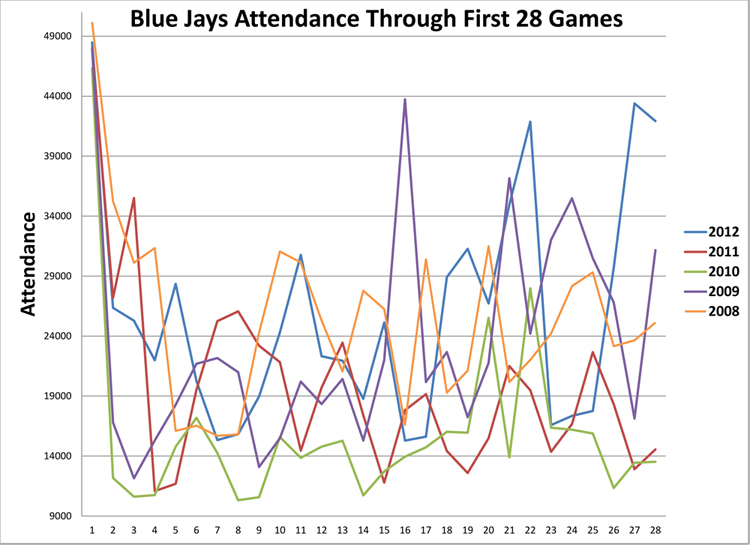 The article suggests the Blue Jays are slowly turning the tide in attendance numbers, and that appears to be true. Over the weekend, the Blue Jays drew 114,993 fans over the course of three games. That actually outnumbers the Blue Jays 2012 Home Opening series (100,109 fans) and even the last three Home Opening series at the Rogers Centre. Those numbers are somewhat surprising considering it was a overall dreary weekend weather wise, and also because the Don Valley Parkway and Gardiner Expressway were closed on Sunday, which made it a headache to get to the dome for some commuters. Frankly, it’s apples to oranges as often times comparing attendance numbers straight up is an inexact science. It all depends on whether it’s the Yankees/Red Sox, whether it’s a long weekend, and even giveaways. Nonetheless, here are what the attendance numbers have looked like over the past five years through the first 28 home games of the season. 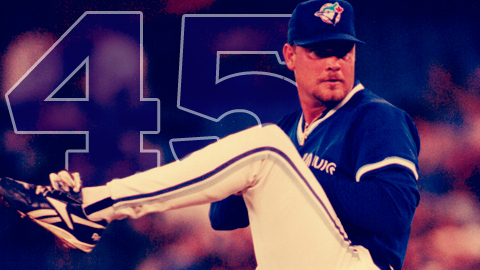 To this date, 725,336 fans have passed through the turnstiles at the Rogers Centre since Opening Day. During that same time period last season, 556,009 fans turned out to see the Blue Jays in 2011. That’s an incredible 23% increase in ticket sales year over year through the first 28 home games. 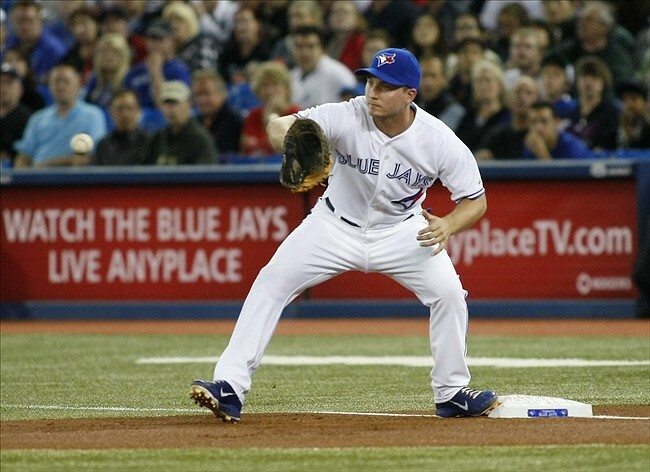 The Blue Jays have been benefit of a few high marquee opponents this early in the season. They did open the season against the Red Sox and just wrapped up a three game set against them, but aside from that, there really haven’t been any other big draws that can be attributed to the opponent. The New York Mets series that drew 103,541 fans was a bit of a perfect storm; it coincided with a holiday weekend, it was balmy weather that weekend, and there was also a bobblehead giveaway on the Sunday. Remove just one of those elements, and there’s no way 100,000+ fans come out to see the Mets. Even though the Blue Jays have been the benefit of some favourable matchups so far, I think this is a trend that’s likely to continue. And I think the key demographic that’s making a difference in attendance is definitely the younger crowd. I’m definitely seeing a much young contingent at the ballpark these days, and not only are the fans getting younger and younger, but it seems like they’re even more rabid for Blue Jays content than any other cross-section of fans. When I say younger, I don’t mean young children aged 5-10, I mean the 12-18 crowd. It seems like that demographic was virtually non-existent just a few years ago. And if these fans are going to take the path like many of us did, then they’ll be fans for life. Now with the integration of Twitter Tuesdays and other various social media, the Blue Jays are right up these young fan’s alleys. The word is spreading like wildfire, and I think a lot of it had to do with the youthfulness of this team. The fans truly feel like they can connect much more freely with players like Brett Lawrie, J.P. Arencibia, Colby Rasmus and Ricky Romero. As much as some people dislike the Twitter Tuesdays promotion, if it helps breed a new crop of Blue Jays fans, then I’m all for it. All these things considered, it’s finally “cool” to be a Blue Jays fan again. In previous years, Blue Jays devotees used to be in the minority in the city of Toronto and across Canada … but not anymore. Even the TV numbers are up 19% compared to last season (via Blue Jays producer Doug Walton). Ultimately though, it’s not how many times Brett Lawrie tweets or the giveaway days that will drive more people to the Rogers Centre. We all know a consistent winning environment is the key to steadily building attendance numbers. However, the early results from the 2012 attendance numbers are very encouraging. The Blue Jays have done almost everything right off the field to drive up attendance numbers, now they just need everything to go right on the field to bring in even more fans. Definitely. As far as the tv ratings go, the 19% increase is great, and that's on top of a 17% increase last year over the year before that. And apparently the biggest increases have been in the younger demographics there as well. It seems almost everyone I see around here wearing a Jays hat (K-W) is young. If this team can really win, there is going to be a hell of a resurgence in the fanbase. It really is an encouraging sign – after all, these young fans are the new generation of Blue Jays fans. So it's imperative that they spread the word! My wife is a Redsox I know, start the burning fire now. However, she has never been to Redsox stadium and neither have I. I really want it to be special so we bought for tickets in section 203 "bleacher creature". For a Red Sox fan, this can be VERY intimidating arriving to a ballpark with drunk fans saying inappropriate things.